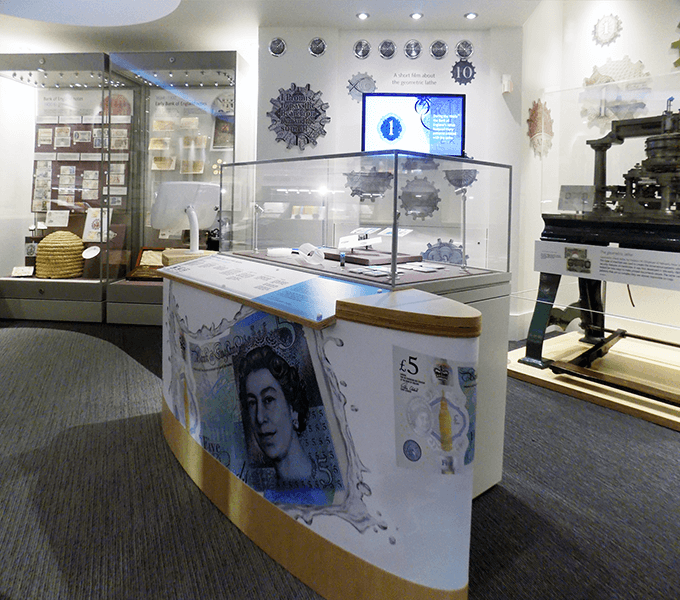 To coincide with the launch of the new polymer £5 note, Tuch have redesigned the Banknote gallery at the Bank of England Museum. The display covers the origins of paper money through to the latest developments in security features and polymer substrate, culminating in the new Churchill fiver which entered circulation on 13 September. 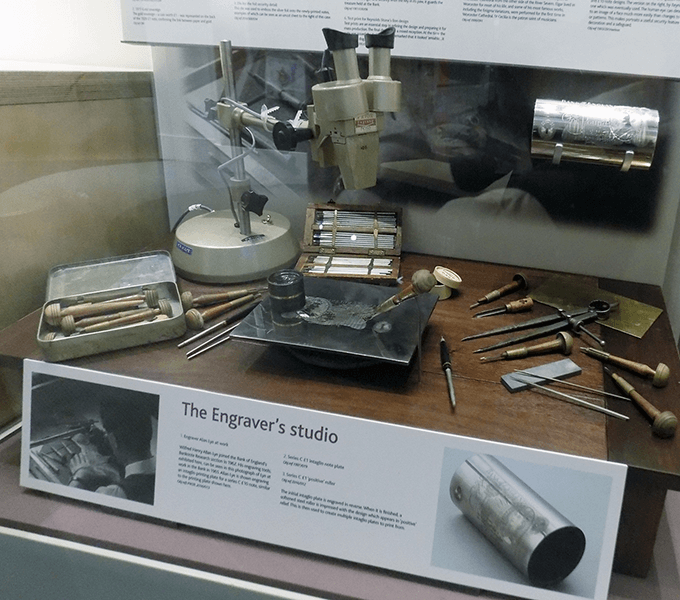 The original gallery had barely been touched since the museum opened in 1987, and the chronological display in outdated showcases concentrating on paper money had run out of space to display recent Banknotes. It was also difficult to navigate with cases set into false pilars and large raised plinths. Working with Cubit3D we opened up the space to create a clean and modern area, preserving the original decorative ceiling feature whilst making the display wheelchair and child-friendly. Use of new free-standing showcases and custom-built furniture make the display area flexible and future-proof it for changes and development. Examples of rare banknote of forgeries and ‘flash notes’ through the ages, including the infamous WWI Bernhardt £5 forgeries. Refurbished original ceiling feature with led strip lighting and suspended 1960s ’dandy roll’ watermark mould. Column cladding doubling as ‘welcome’ panel and ‘selfie’ backdrop - with floor to ceiling shot of banknote vault. Seating built from genuine ‘cage’ used in vaults for storing and transporting banknotes, filled with ‘£50 notes’! 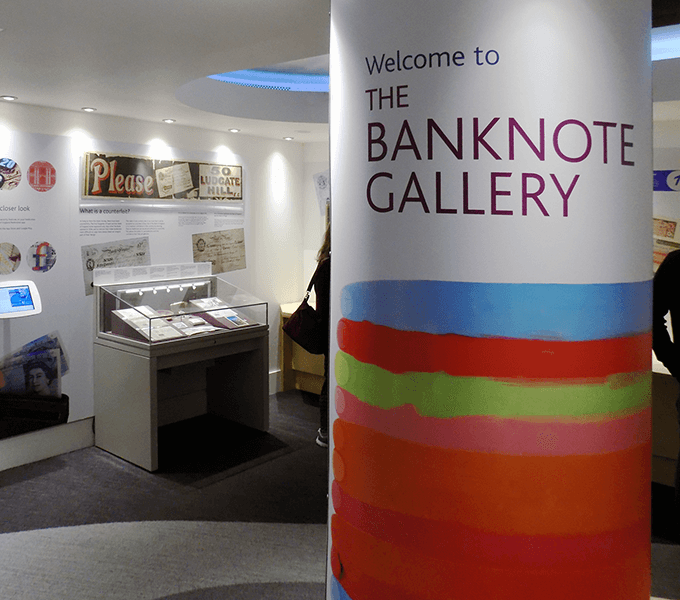 The Banknote gallery is in the Bank of England museum, where you can see many of our other projects. Admission free, open Monday – Friday 10am to 5pm.